You are currently browsing the tag archive for the ‘Elmer Fudd’ tag. 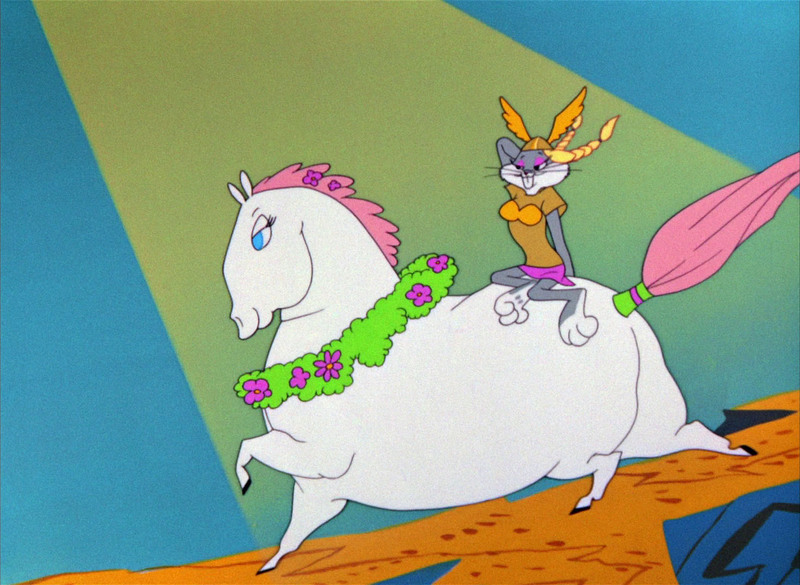 ‘Rabbit of Seville’ is the second of three superb Chuck Jones Bugs Bunny cartoons on opera, bridging ‘Long-Haired Hare‘ (1949) and ‘What’s Opera, Doc?‘ (1957). 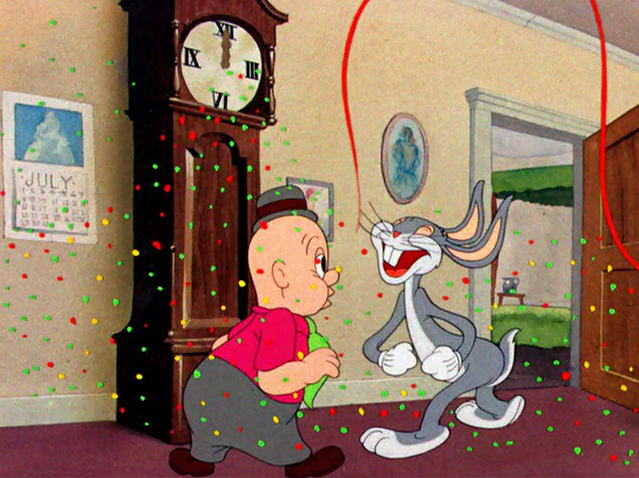 The cartoon starts with an open air opera theater setting with the Elmer-Bugs chase quickly entering the scene. 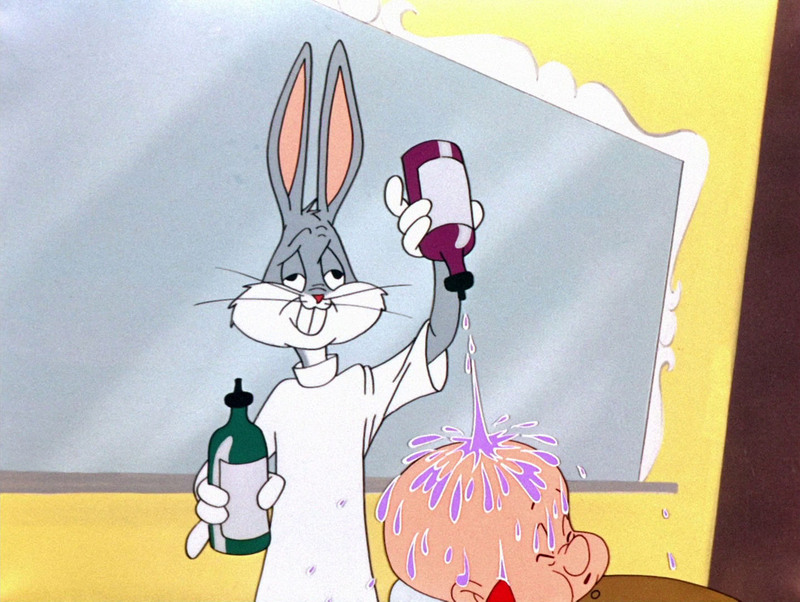 When Elmer hits the stage, Bugs quickly opens the curtains, prompting the orchestra to play ‘The Barber from Seville’ by Gioachino Rossini. This leads to a wonderful aria by Bugs, and even Elmer joins in. But the best part of the film is the silent comedy that follows on the music of the opera’s overture. During this sequence Bugs Bunny’s expressions are priceless, and the action is beautifully staged to the music, leading to a great finale in which Elmer and Bugs get married. Throughout the picture Jones’s timing and staging are perfect. It improves on both Charlie Chaplin’s barber scene in ‘The Great Dictator’ (1940) and on the vaguely similar Woody Woodpecker cartoon ‘Barber of Seville‘ (1944). The result is no less than a masterpiece. Surprisingly, this cartoon about ‘The Barber of Seville’ does not feature the famous ‘Largo el factotum’ aria from that opera. This is remarkable, for this aria was a staple in cartoons, and used extensively in e.g. ‘Barber of Seville’, the Tex Avery cartoon ‘Magical Maestro’ and Chuck Jones own Tom & Jerry cartoon ‘The Cat Above, The Mouse Below‘ (1964). ‘What’s Up, Doc?’ starts very much like Friz Freleng’s ‘A Hare Grows in Manhattan‘ from 1947: Bugs Bunny is a Hollywood star, interviewed by the press. 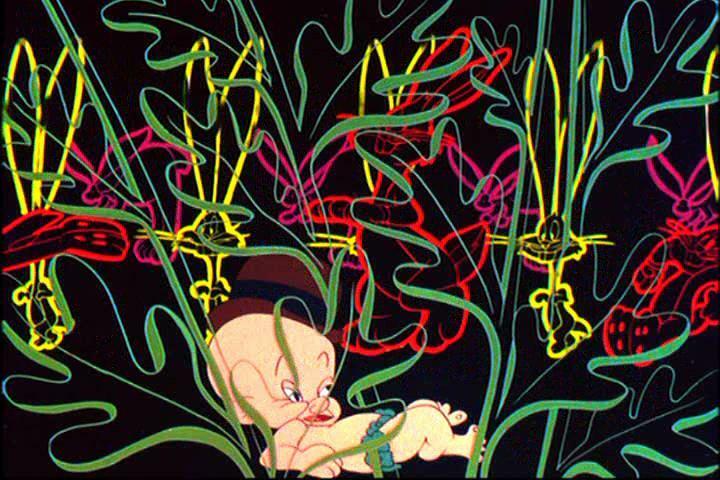 However, Writer Warren Foster and director McKimson’s take is much funnier than Freleng’s: instead of turning to an ordinary chase sequence, the duo retains the idea of Bugs being a real actor throughout the picture. The cartoon shows his erratic career in the vaudeville scene. The most absurd take is when Bugs Bunny is down in the dumps. We seem him hanging out in the park with actors, who, by 1950, belonged pretty much to the has-beens: Al Jolson, Jack Benny, Eddie Cantor and Bing Crosby. At this point, it is Elmer, “the famous vaudeville star”, who turns Bugs into a star. We watch the duo performing in what must be the most terrible vaudeville act ever put on screen. But when Bugs utters “what’s up, doc” the duo hits the jackpot. This loony, self-satirizing from-rags-to-riches story is entertaining throughout, and leads to a great finale. 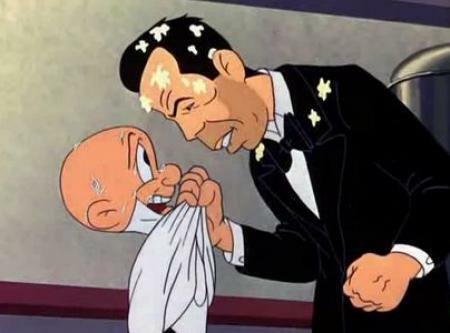 It may well have inspired the equally tongue-in-cheek opening sequence of ‘Singin’ in the Rain’ (1952), which shows some similarities to McKimson’s short. 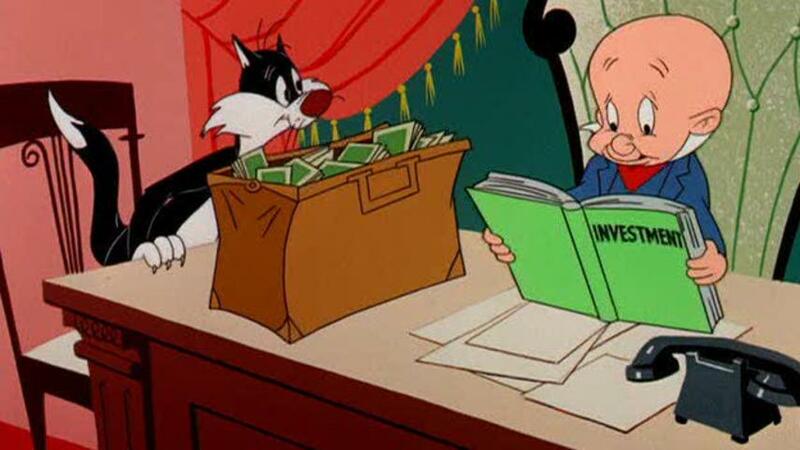 ‘What’s Up, Doc?’ is without doubt one of McKimson’s best cartoons. Sadly, the film more or less marks the end of McKimson’s most inspired era, for during the 1950s the quality of his cartoons steadily declined, becoming more and more routine, and less and less funny. 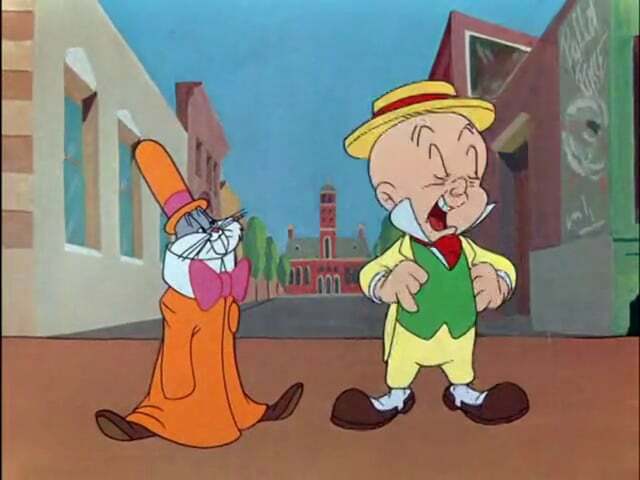 One of the most celebrated animated cartoons of all time, ‘What’s Opera, Doc’ places the typical Elmer Fudd-Bugs Bunny chase routine into the world of Wagnerian opera. The cartoon’s masterstroke is that it uses all the cliches of the chase, which go all the way back to the first Bugs Bunny Cartoon ‘A Wild Hare‘ (1940), but that they are carried out in the most serious, Wagnerian fashion. The result is ridiculously pompous, mocking Wagnerian opera, as well as playing homage to it. Milt Franklyn’s score quotes music from five Wagner operas: ‘Der fliegende Holländer’, ‘Die Walküre’, ‘Siegfried’, ‘Rienzi’ and ‘Tannhäuser’. 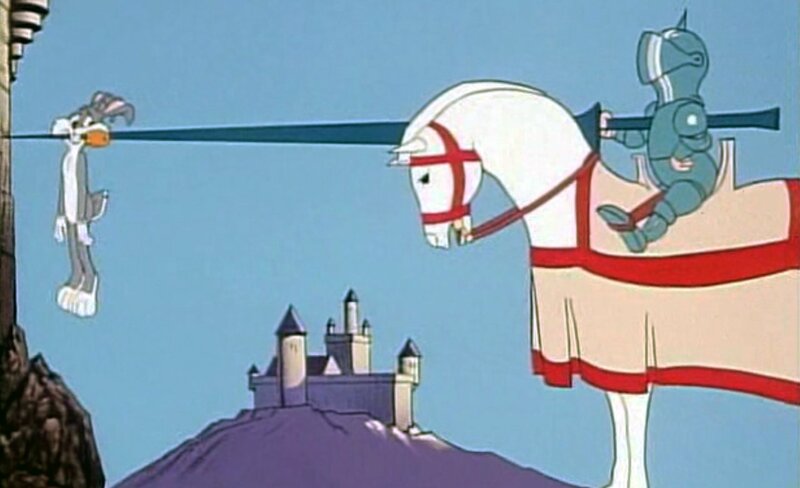 The cartoon’s operatic character is emphasized not only by operatic singing, but also by featuring Wagnerian magic (a magic helmet), a ballet (a staple of French opera, but only employed by Richard Wagner in his very first operas), and a sad ending, a cliche of 19th century opera in general. 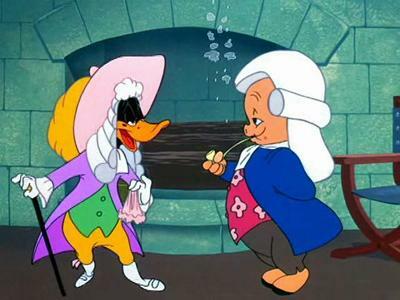 Michael Maltese provided new lyrics to Wagner’s pilgrim chorus from ‘Tannhäuser’ and made it into a rather Hollywood musical-like love duet between Elmer and Bugs. The animation is outstanding throughout, especially in the ballet and love duet between Bugs and Elmer. Indeed, for the ballet sequence the animators studied Tatania Riabouchinska and David Lichine from The Original Ballet Russe, and there’s a genuine seriousness about this scene. Yet, the main attraction of the cartoon lies in Maurice Noble’s extreme background layouts and bold color designs. Especially when Elmer gets furious, there is a startling emotional use of colors that has not been seen on the animated screen since ‘Bambi‘ (1942). The opening sequence, with Elmer casting a mighty shadow is a straight homage to ‘The Night on Bold Mountain’ sequence from ‘Fantasia’ (1940), while the shots of Bugs being dressed as Brünnhilde and riding an oversized horse are retaken from ‘Herr meets Hare’ from 1945 (which, like ‘What’s Opera, doc?” was also penned by Michael Maltese). In this sense the cartoon is as much a homage to animation history as it is to opera. ‘What’s Opera, doc?’ is a brilliant cartoon of pure grandeur and one of Chuck Jones’s all time masterpieces. What’s most striking is that it was made during the normal grind of a commercial animated cartoon studio. The film took much longer than normal to make, which Jones and his unit could only manage to do by cheating on their schedule, stealing time from a much more ordinary short, the Road Runner cartoon ‘Zoom and Bored’ (1957). 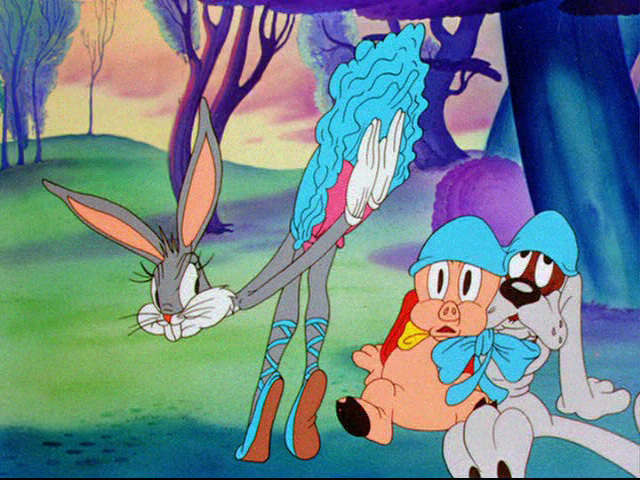 McKimson’s second Bugs Bunny cartoon is way funnier than his first one, ‘Acrobatty Bunny‘ (1946). 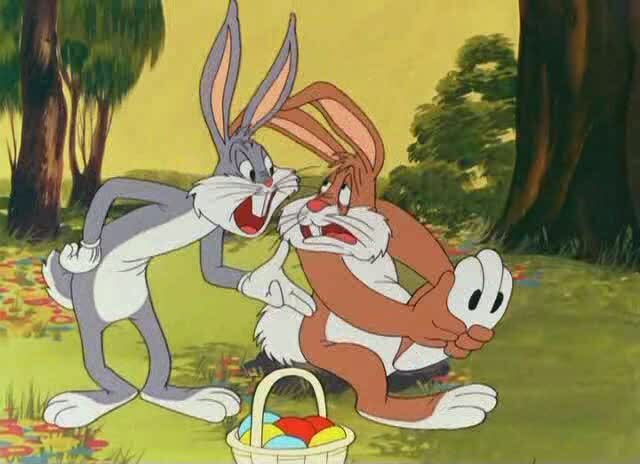 In ‘Easter Yeggs’, Bugs Bunny encounters a lethargic Easter Bunny who makes Bugs replace him, because he has ‘sore feet’. 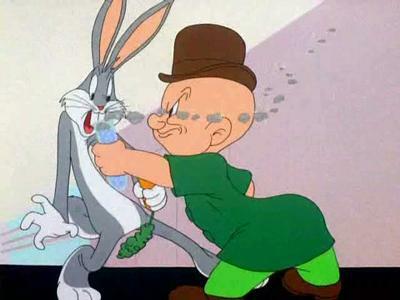 Bugs ends up delivering Easter eggs in some slum, where he’s troubled by an unbelievably annoying little red-haired kid. 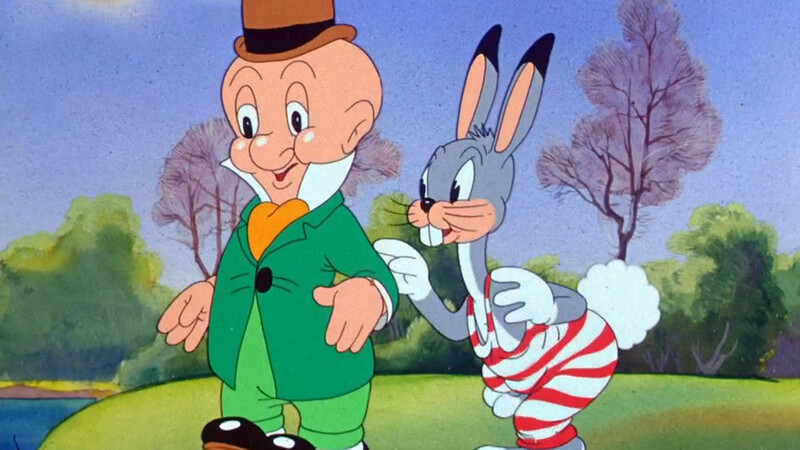 In his next attempt he encounters Elmer Fudd, who’s only after Easter bunny stew. Penned by Warren Foster, ‘Easter Yeggs’ is a hilarious cartoon, and without doubt among both Robert McKimson’s and Bugs Bunny’s all time best. 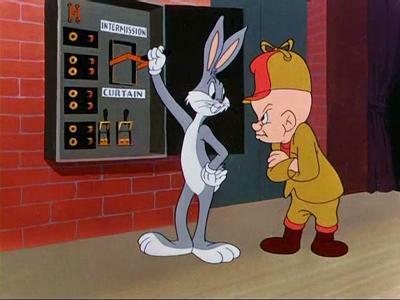 Its highlight may be Bugs’ performance as a magician conducting a misguided trick with Elmer’s watch. In ‘Hare Remover’ Elmer Fudd is an unlikely evil scientist developing a potion to change animals into monsters. He tries it on a dog, but it only makes it eat grass. Because he has run out of test animals, he has to find a rabbit to try the potion on. Enter Bugs Bunny. What follows is a plot in which both characters think they’ve turned the other into a monster, which happens to be a totally confused bear. ‘Hare Remover’ was to be Frank Tashlin’s last Warner Brothers cartoon and the second of only two Bugs Bunny cartoons directed by him. Unfortunately, it’s not a grand finale. Despite some great gags and a clever story, the director seems at loss with the two personalities. Elmer, who has a slightly altered design, having suddenly received buck-teeth, is awkward enough as a scientist. But watching Bugs being aghast that he really has made his foe into a monster, and trying to revive Elmer’s former self by making a chemical drink of his own, is just out of character. In September 1944 Frank Tashlin would leave Warner Brothers, to direct puppet films for the Joan Sutherland studio. Then he left animation all together to work at feature films, first as a gag writer and screen writer, then as a director, in 1951. Robert McKimson would succeed Frank Tashlin as a director. When Bob Clampett left Warner Brothers, too, in May 1945, the studio had entered a new era. The wild days were over. 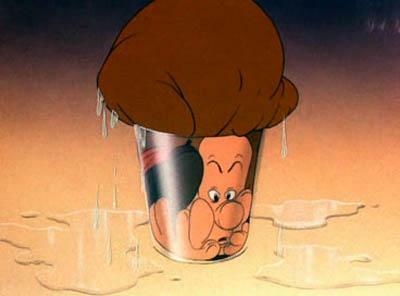 In ‘Back Alley Oproar’ a sleepy Elmer Fudd is kept awake by Sylvester’s singing in his back alley. Sylvester turns out to be a rather talented alley cat. His performance is quite infectious, and includes the famous Largo al factotum aria from Gioachino Rossini’s ‘Il barbiero di Seviglia’, Liszt’s second Hungarian Rhapsody (which he performs by stamping with heavy boots on the staircase), “You Never Know Where You’re Goin’ Till You Get There” and “Moonlight Bay”. 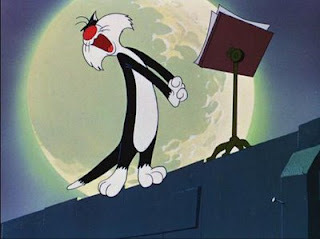 At last, Elmer tries to blow Sylvester to smithereens, but they are both killed, and on his way to heaven, Elmer is disturbed by Sylvester’s nine lives singing the Sextet from Gaetano Donizetti’s ‘Lucia di Lammermoor’. ‘Back Alley Oproar’ is one of director Friz Freleng’s cartoons in which he spreads his own love for music. He does so in a very entertaining way. 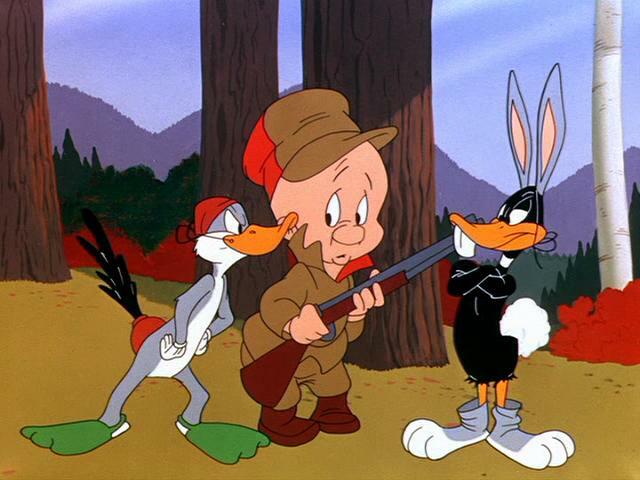 The cartoon was the first of only four Elmer Fudd-Sylvester pairings. Only Freleng coupled these two characters, although they did co-star in Chuck Jones’ ensemble film ‘The Scarlet Pumpernickel‘ (1950).